John Kasich: Pause accepting Syrian refugees to create stringent checks. Asa Hutchinson: Europe, Asia or Africa are better for Syrian refugees. Colin Bonini: Don't accept Syrian refugees to settle in Delaware. David Ige: Welcome refugees from Syria with aloha. Jack Markell: Provide asylum for Syrian refugees seeking safety. Jerry Brown: Syrian refugees should be fully vetted, then given asylum. Paul LePage: Irresponsible to allow Syrian refugees into America. Steve Beshear: Do the Christian thing to welcome Syrian refugees. Jeb Bush: Syrian refugee camps in Jordan are really quite nice. Lindsey Graham: Create safe haven for refugees, not bring them to US. Marco Rubio: Too risky to take in Syrian refugees. Bernie Sanders: Moral responsibility to reach out to Syrian refugees. Hillary Clinton: We should accept 65,000 Syrian refugees, vetted and screened. Martin O`Malley: We should accept 65,000 Syrian refugees who are fleeing ISIL. Jill Stein: Take 65,000 Syrian refugees immediately, not over 18 months. Sam Brownback: Halted Syrian refugees from being resettled in Kansas. Chris Christie: Syrian refugees cannot be vetted; don't allow any into US. 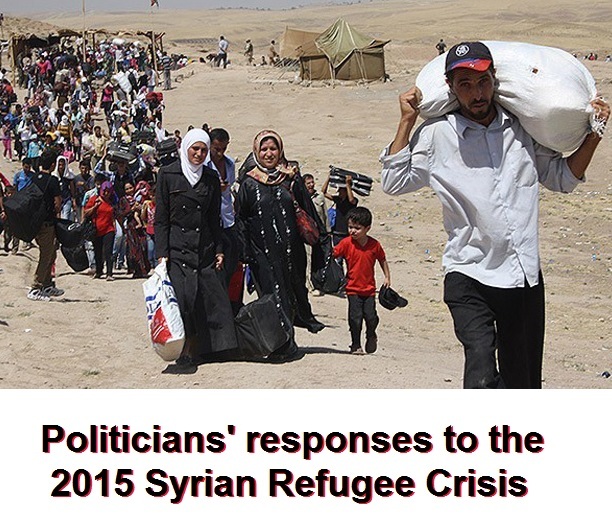 Larry Kudlow: Moratorium on Syrian refugees must be in place. Ken Spaulding: 18-to-24 months for Syrian refugees is plenty of vetting. Roy Cooper: Pause Syrians for most effective screening process possible. Maggie Hassan: Terrorist attacks strengthen our resolve to defeat ISIS. Bobby Jindal: Demand info on background & monitoring of Syrian refugees. Chris Christie: No Syrian refugees in US, not even infant orphans. Jay Nixon: No Syrian refugees in MO; screening & safeguards needed. John Kasich: No more Syrian refugees in Ohio or anywhere in USA. Mark Dayton: Existing security checks for Syrian refugees are sufficient. Nikki Haley: Persecuted immigrants are welcome--but not Syrian refugees. Scott Walker: Syrian refugees pose a security threat. Steve Bullock: Don't let terrorists intimidate us to abandon our values. Terry Branstad: Protect residents with info on where Syrian refugees are. Jeb Bush: Syrian refugees already in US can stay. Ben Carson: Religion not sufficient probable cause to track. Jay Williams: Welcome Syrian refugees fleeing religious intolerance. Marco Rubio: In 2013, refugees were fleeing oppression; not like Syrians. Alan Grayson: Screening process for refugees from Iraq & Syria ok as-is. Ann Kirkpatrick: Screening process for refugees from Iraq & Syria ok as-is. Joe Heck: Stronger screening process for refugees from Iraq and Syria. Pat McCrory: Stop sending Syrian refugees to North Carolina. Kate Brown: Open the doors of opportunity for Syrian refugees. Maggie Hassan: Temporarily halt acceptance of refugees from Syria. Maggie Hassan: Close borders for now; but welcome ISIS refugees later. Andrew Cuomo: No comment on changing rules for Syrian refugees in NY. Bill Haslam: Suspend placing Syrian refugees in Tennessee. Bill Walker: Deal with budget instead of focusing on Syrian refugees. Brian Sandoval: Review Syrian refugee resettlement --but don't halt it. Bruce Rauner: Temporarily suspend accepting new Syrian refugees. Butch Otter: Halt Syrian refugees until vetting rules instituted. Dan Malloy: Continue to accept refugees from Syria. Dennis Daugaard: S.D. shouldn't expect any Syrian refugees. Doug Ducey: Immediate halt to placement of any new Mideast refugees. Earl Ray Tomblin: We'll screen Syrian refugees if they arrive. Gary Herbert: Review Syrian refugee security, but keep accepting them. Gina Raimondo: Help settle Syrian refugees. Greg Abbott: Ordered no more Syrian refugee resettlement. Jack Dalrymple: N.D. shouldn't expect any Syrian refugees. Jay Inslee: Washington state welcomes Syrian refugees. John Hickenlooper: Stringent verification process for Syrian refugees. Larry Hogan: Reasoned & careful decision about resettling Syrian refugees. Maggie Hassan: Halt acceptance of Syrian refugees until fully vetted. Mary Fallin: Suspend sending Syrian refugees until checking is assured. Matt Bevin: Oppose the resettlement of Syrian refugees. Mike Pence: Suspend the relocation of any more Syrian refugees. Nathan Deal: Executive order to not accept Syrian refugees. Pat McCrory: Cease sending Syrian refugees until checking is effective. Peter Ricketts: No Syrian refugee resettlement until full federal review. Peter Shumlin: Rejecting Syrian refugee stomps on American greatness. Phil Bryant: Do everything possible to keep Syrian refugees out of MS.
Rick Scott: Aggressively block attempts to relocate Syrian refugees. Rick Snyder: Welcome Syrian refugees to Michigan, after full review. Robert Bentley: Refuse Syrian refugees relocating to Alabama. Sam Brownback: Executive order to not assist Syrian refugees. Steve Bullock: Safety first; review protocols for Syrian refugees. Susana Martinez: No more Syrian refugees until vetting plan in place. Terry McAuliffe: Syrian refugee already undergo intensive security screening. Tom Wolf: Continue resettling Syrian refugees with federal screening. Donald Trump: Need to keep database of Muslim refugees. Maggie Hassan: Ensure robust screening before we admit refugees from Syria. Donald Trump: Syrian refugee crisis partly our fault; but don't take any. Tim Kaine: Allow more Syrian Refugees to resettle in US. John Kasich: Broadcast Judeo-Christian values abroad, to help defeat ISIS. Ben Carson: Support Syrian refugees in Jordan; place more with Kurds. Lindsey Graham: If Syrian war goes on another year, Jordan's king might fall. John Kasich: No-fly zone 1st priority, but ok with more aid for refugees. John Kasich: US ground troops in Syria, but not involved in civil war. Maggie Hassan: We are at war on ISIS; intensify our efforts to destroy them. The above quotations are from Opinions and policy on the Syrian Refugee crisis.